As a general rule the more simple the pasta, the more you should stick with tradition. 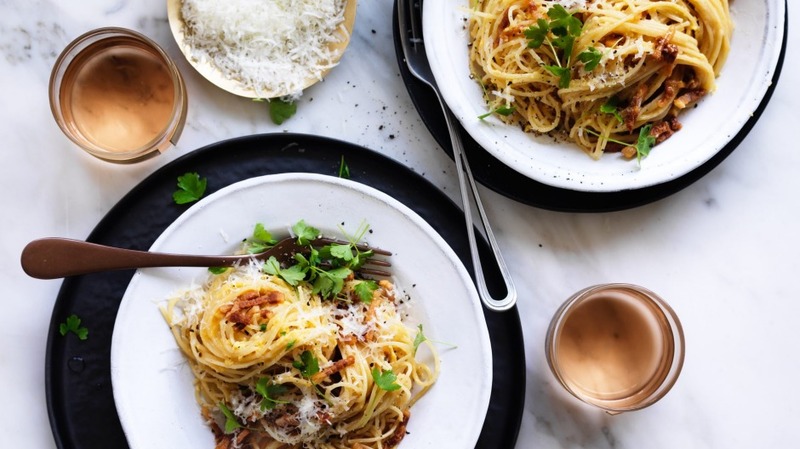 Most Aussie families would make lasagne with cheese sauce instead of the traditional besciamella and nobody seems to bat an eyelid, but cream in carbonara? Wars have started over less. 1. Slice the guanciale or pancetta into thin matchsticks. Heat a small saucepan over medium heat, add the oil and saute the guanciale slowly for about eight minutes until the fat is rendered and the guanciale is crisp. 2. In a separate bowl, beat the eggs and extra yolks well, then whisk through the pecorino parmesan. 3. While the guanciale is cooking, bring a large pot of water to the boil and add a good amount of salt. Boil the pasta in salted water according to the packet directions, and, just as it's cooked to your liking, take an espresso cup and scoop out a cup of the pasta water. 4. Drain the pasta and return it to the warm pot (the warmth of the pot will help the emulsification). Add in the guanciale and all the rendered oil, the egg and cheese mixture and the reserved pasta water. 5. Stir briskly until the oil, egg, cheese and pasta water have combined to make a creamy sauce that coats the pasta. 6. Grind through the black pepper, stir and serve immediately with a little extra pecorino parmesan.